I was sent a copy of the DVD for my review. No other compensation was given and my opinion is my own. FROM THE BACK OF THE DVD: Patters of Evidence is an award-winning documentary by filmmaker Timothy Mahoney that chronicles an in-depth archaeological investigation in Egypt as his team attempts to corroborate the biblical text. The film explores one fundamental question: Is there any evidence that the Exodus story actually happened? Twelve years in the making, this provocative documentary reveals new or rarely seen evidence regarding the Israelites descent into slavery, their Exodus from Egypt and their ultimate conquest of the Promise Land. 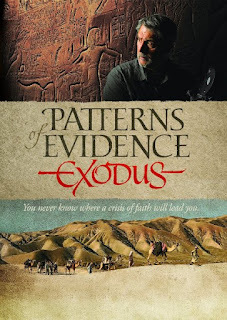 Although many scholars and archaeologists deny the validity of the Exodus story for lack of proof, Patterns of Evidence: Exodus builds a case that sheds new light on the story. As I watched and saw things I'd read and seen years ago I started remembering all the Sunday School classes I have been in. Most of the archaeological finds mentioned were totally new to me. An entire new way of history that supports the Bible, was opened up. The film is narrated in an easy to understand way that any one can understand. I really enjoyed Patterns Of Evidence and you can bet that I will be watching it more than once. I can see incorporating this into my boys homeschool learning when they reach middle school age.